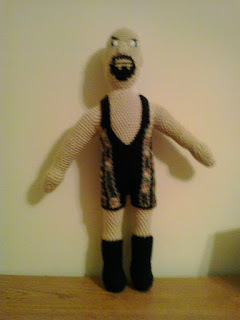 This a larger version of my WWE Big Show Doll pattern. This is doll when finished is about 2 feet tall. The pattern was made by easily increasing the number of stitch and rounds of all the pieces of the Annabelle Doll pattern by 50%. Worsted weight yarn: Buff, black, white, camo, and grey heather. BEGIN STUFFING THE ARMS FIRMLY. CONTINUE STUFFING ARMS FIRMLY AS YOU GO ALONG. Finish off leaving a long tail. Place BOOTS on LEGS and sew back seam closed. Rd 2: sc in next sc, 2 sc in next sc, sc in next sc, holding next sc on BODY and sc #11 on RIGHT LEG together and working through both thicknesses, sc in next sc, sc in next sc on BODY, 2 sc in next sc, sc in next sc, holding next sc on BODY and sc #2 on LEFT LEG together and working through both thicknesses, sc in next sc. Rd 31: holding next sc on BODY and sc #8 of LEFT ARM together and working through both thicknesses, sc in next sc, sc in next 23 sc on BODY, holding next sc on BODY and sc #2 on RIGHT LEG together and working through both thicknesses, sc in next 4 sc, sc in next 23 sc on BODY, holding next sc on BODY and sc #11 on LEFT ARM together and working through both thicknesses, sc in next 3 sc, slip st in next sc. Rd 32: sc in next 11 sc on BODY, 2 sc in next sc, sc in next 11 sc, sc in next unworked sc on RIGHT ARM, working in sc behind same ARM, sc in next sc, ch 2, skip next 2 sc, sc in next sc, skip next 12 sc on same ARM, sc in next sc, sc in next 11 sc on BODY, 2 sc in next sc, sc in next 11 sc, sc in next unworked sc on LEFT ARM, working in sc behind same ARM, sc in next sc, ch 2, skip next 2 sc, sc in next sc, skip next 12 sc on same ARM, sc in next sc. BEGIN STUFFING THE BODY FIRMLY. CONTINUE STUFFING BODY FIRMLY AS YOU GO ALONG. Finish off leaving a long tail. Sew to HEAD. Finish off. Sew to FACE bunching Row 1 together. Embroider EYES, EYEBROWS, and MOUTH on face of DOLL. Rd 2: Ch 1, sc in next 2 sc, ch 20, sc in next 4 sc, ch 20, sc in next 2 sc, slip st in first sc. Rw 2: Ch 1, turn; sc2tog, sc in next sc, 2 sc in next sc, change to grey heather, sc previous sc and next sc together, change to camo, (sc previous sc and next sc together) twice, change to grey heather, sc previous sc and next sc together, change to black, sc previous sc and next sc together, change to camo, sc in next sc. (10) Change to black. Rw 4: Ch 1, turn; sc2tog, 2 sc in next sc, change to grey heather, sc previous sc and next sc together, change to camo, (sc previous sc and next sc together) twice, change to grey heather, sc in next sc. (7) Change to camo. Rw 6: Ch 1, turn; sc2tog, sc in same sc as previous sc, change to grey heather, sc previous sc and next sc together, change to camo, sc previous sc and next sc together. (4) Change to grey heather. Rw 3: Ch 1, turn; sc2tog, sc in next 2 sc, change to grey heather, sc in next sc, change to camo, sc in next 2 sc, change to grey heather, sc in next sc, change to black, sc2tog. (8) Change to grey heather. Rw 7: Ch 1, turn; sc in next 3 sc, change to grey heather, sc in next sc. (4) Change to black. Finish off. Weave in ends. Place SINGLET on WWE BIG SHOW and straps together. Weave in ends. Big Show and WWE are copyright World Wrestling Entertainment and their respective creators. This crochet pattern is an original pattern and is © by Christjan Bee (July 2018). Please do not claim this pattern as your own. If you wish to share this pattern, you may link to this pattern but please do not reprint/repost it on your site. You may print and keep a copy for your own personal use, but you may not sell or distribute it, or sell items made from this pattern.